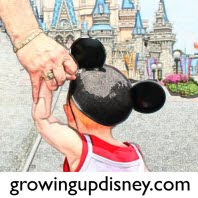 Growing Up Disney: Spring Fever or No WDW Reservations! OK… we are getting close to the end of winter. Spring will begin soon and spring fever will begin to set in. For me it has started already. Today is March 1st and I don’t have any reservations for a trip to Walt Disney World! ﻿As I sit writing this, I do not have any reservations to go to Walt Disney World and don’t know when I’ll be going back. I am very busy at work this year and dreaming of the time I can retire when trips will be easier to plan. I’ve been talking to my wife about a trip in December for our 40th wedding anniversary, but have not made any reservations. We went to Walt Disney World on our Honeymoon in 1973. (See The Family Behind the Blog tab for an almost 40 year old picture from our honeymoon). I had talked to her about going on the Disney Vacation Club Members Cruise on the Disney Cruise Line in September to celebrate our anniversary but she did not want to spend that much money on a trip. Since Amy and her family live a few states away, if her family is not going with us to Walt Disney World, I rather vacation at her house to visit with the granddaughters. (Thank goodness for FaceTime so I get to see them occasionally). So I sit here with my spring fever getting worse, thinking about our next trip, yet to be planned. My wife asked me last week where I’d like to go for dinner. I answered, “Olivia’s” and she surprise me by saying, “Me too!” Of course, Olivia’s is the restaurant at Disney’s Old Key West Resort and is pretty much my stock answer to where I’d like to go for dinner. There are better restaurants at Walt Disney World than Olivia’s, but it is the restaurant at my Home-away-from-Home at Walt Disney World for the past 20 years and I enjoy eating there. And besides, if I can eat at Olivia’s it means I am at Walt Disney World! December is a long way off, and it may take till then before I go back. There may have been an occasional year over the past 20 years since we became Disney Vacation Club Members that we have not been at least once… but not very many. And I do have Amy and Ridge who would love to use our Vacation Club Points for a stay if they can (both of them are listed as owners on our DVC deeds). Ridge has a reservation for May for Star Wars weekend. Amy currently does not have any reservations as this year is busy for her too. And I sit here dreaming of when I will be back. Do you have reservation? When is your next trip? When is your favorite time to visit Walt Disney World? Have you seen New Fantasyland? WOW! I've never been to Disneyland. Your trip does sound exciting!! Love to hear all about it when you return.